By Karrar Haider in Desktop. Updated on December 9, 2017 . From managing tabs to increasing productivity, Chrome has a whole bunch of handy extensions to empower the user. For me, Chrome is the go-to browser through which I manage my financial accounts and sensitive data. But to ensure all of that information stays safe, I take advantage of multiple Chrome security extensions that turn out absolutely useful. Sharing with you my experience with Chrome security extension, I have jotted down 10 of the best and must-have extensions for Chrome that will help you secure the browser and all your sensitive information. Let’s dig right into it. It’s my favorite Chrome extension for overall security while surfing the web. I personally like its phishing attack protection feature that automatically scans key elements of a web page to detect whether a page is official or fake one and warns you immediately. It also auto-corrects mistakes in a URL to ensure you don’t end up on a fake website. 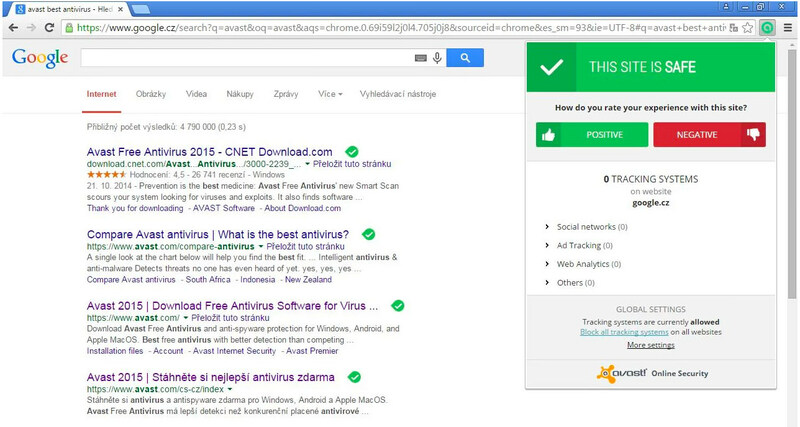 Avast Online Security uses community rating system to rate websites and helps you in detecting the dangerous ones. On top of that, it also blocks tracking cookies that track your activity for analysis purposes. An encrypted connection (HTTPS) ensures no one could monitor your activity or steal data. Unfortunately, not all websites support HTTPS connection, and this is where HTTPS Everywhere comes in. It is a Chrome extension that will try to connect to an HTTPS version of websites if possible. This allows you to get HTTPS connection on thousands of websites that by default connect you to an insecure HTTP connection. Just install the extension, and it will start doing its job. If you are concerned about your online privacy or simply want to get rid of trackers that may be slowing down your browsing, then Ghostery is the best extension for this purpose. It basically gives you full control over trackers and let you decide which to block or unblock. It lists all types of trackers in its settings from where you can individually block/unblock them. However, you can also click on the Ghostery extension button while browsing a website to see its trackers and disable them if needed. I also really like their tracker categories such as advertisements, analytics, and social media, etc. that will let you block tracking of a specific type. A password manager is a must to ensure all your login credentials stay safe. Although there are many password managing tools available online, but I find Blur to be the most secure one, thanks to its added security features. It does a perfect job of saving and managing your online passwords in an encrypted environment. It also masks your credit card and billing information from shopping sites and lets you shop online without even giving up your actual credit card or information. Blur’s tracking protection feature blocks all types of trackers. Interestingly, it also blocks trackers that don’t depend on cookies, making it a better option than insecure browsing. Similar to Avast Online Security, Web of Trust also uses community rating system. The users can add comments and rate websites to help other users stay safe online. It will automatically warn you if a site is scammy or contains malware of some kind. The websites are rated for both security and child safety standards. Best of all, if there is no rating for a specific website, you can also ask for a review. Once requested, community members will give you insight on the website if they have any experience with it. 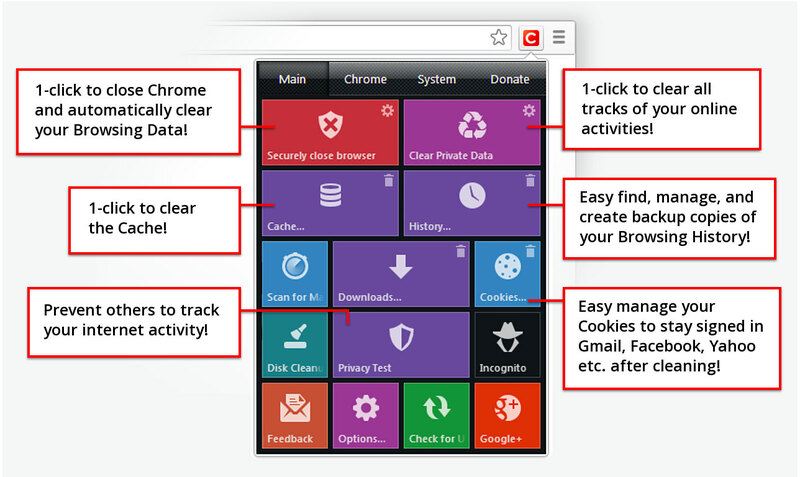 Click&Clean is actually a cleaning tool that does a great job of clearing all the traces of your online activity with a single click. If you need to immediately delete all the stored data about your online activity, simply click on the extension button and it will clear all the internet history, cookies, cache, saved URLs, temporary files, web SQL databases, flash cookies and more. It also has a built-in anti-malware (powered by BitDefender) that will check your PC for any malware. Adding cherry to the cake, the extension is highly customizable and you can configure it to delete only specific type of data. Surveillance Cam Professional is an amazing security asset that will protect your PC and its surroundings. It basically turns your PC’s webcam into a surveillance camera that will take picture of any movement detected by the camera. The picture is then sent to you via email so you could quickly take action. The opportunities are endless with this extension, but a common use would be to ensure no one messes with your PC and the data inside it. 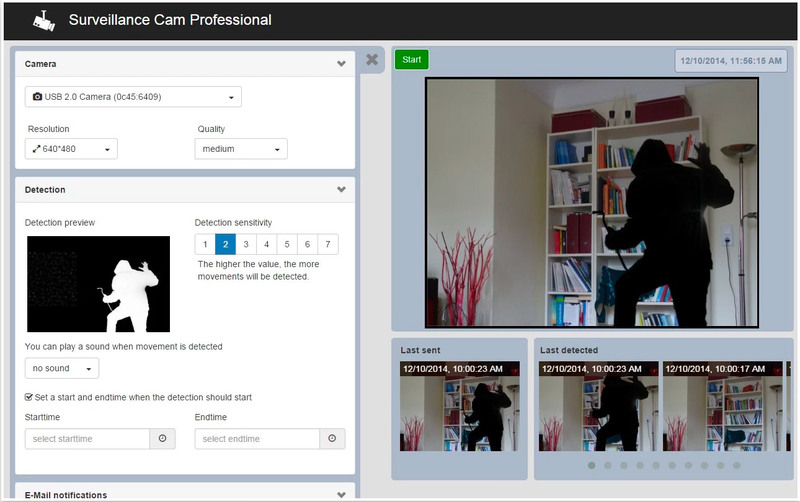 The cam works in stealth mode, and if required, it can also raise an alarm to scare off the intruder. Although the extension developers confirm that they never save your pictures, I will still not recommend you to monitor any sensitive activity with this tool. 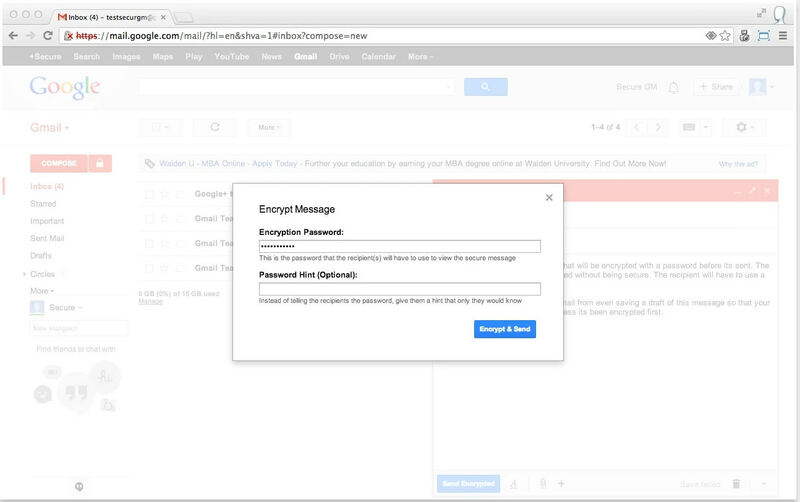 A really handy Chrome extension for Gmail users, Secure Mail for Gmail lets you send encrypted emails to other users that cannot be read by anyone other than you and the intended sender (not even Google). You just need to compose an email and encrypt it with a password. The recipient will have to use the same password to decrypt the email that you use to encrypt it. The encryption also happens on the client side, so even the developers of this extension can’t access this information. If you have very sensitive information to share with someone, then Secure Mail for Gmail would be your best choice. Although, do keep in mind that the recipient must also install the extension to decrypt the email. As it’s named suggests, Panic Button helps you close everything you are doing with a press of a button when a panic situation occurs. If you are working on something sensitive and suddenly need to wind up everything, simply click on the Panic Button extension button or press the assigned key. All the tabs will close and will be stored in the bookmarks folder. And when the coast is clear, click on the Panic Button extension again to restore all the tabs. It’s the perfect tool to protect your activity from uninvited guests. A VPN is a must to anonymize your online activity and save your data from being intercepted. For Chrome users, DotVPN is probably the best VPN that is fast, reliable and can be easily used for free. 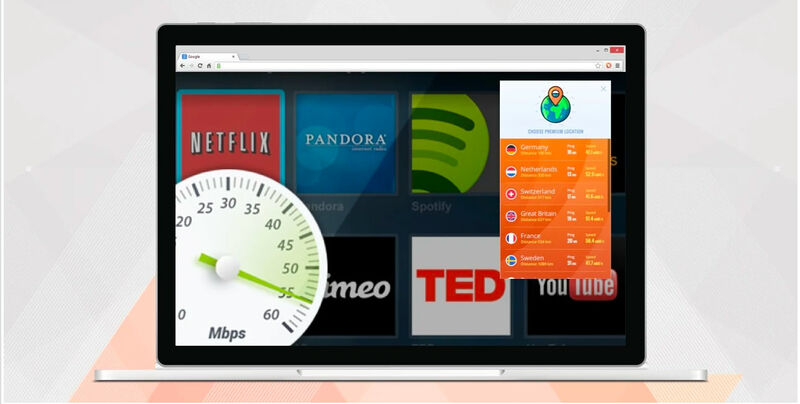 It offers unlimited bandwidth and lets you switch between up to 12 locations for free. And there are no limits on switches as well. DotVPN does more than what a regular VPN service can do. To mention a few of its features; it allows you to open .onion websites, uses 4096-bit encryption, compresses data, and a built-in firewall to protect inbound connections. For ultimate online security, DotVPN will be your best bud. The above extensions should be enough to browse the web securely and keep your information protected. I personally keep most of these extensions active in my browser to give me the best security. However, I only activate extensions like Secure Mail for Gmail and Click&Clean on need basis, which is usually very rare. If you know any other cool Chrome security extensions, or found any of these worth installing, do share with us in the comments below.